The Sixties in Ireland are an obscure time for avant-garde activity. Take the case of Máirtín O’Heaney, who is oft credited with bringing Fluxus and Situationism to Ireland but may have done nothing of the sort. It is a strange story and one that gets even more obscure in the retelling. In retrospect, it is not clear at all if O’Heaney was actually ever a artist at all, though he may have some involvement with political housing agitation in his youth—as he briefly lived next door to Michael O’Riordan in his youth, and attended a few rallies. Born in Dublin in 1946, not much is known about his early existence. After stints cutting carpet and doing roofing for a living in his twenties, O’Heaney seems to have been largely unemployed for most of his adult years. Apart from a brief period where he appeared on a Dublin radio game show playing the part of a country bumpkin, O’Heaney’s public or historic visibility is about nil until 1967. Although the newspaper coverage of his activities during the late 1960s is hyperbolic, fragmentary and inconsistent, it is possible to reconstruct that something happened—and whatever it was, it occasionally made for good copy. Records from this period detail O’Heaney doing performances that were, as far as we could tell in retrospect, not intended for a public audience, though they certainly drew one. For a number of summers—long enough to provide fodder for the art history books—O’Heaney made a strange spectacle of himself, and in some vague sense, the history of the Irish avant-garde received its most cryptic passenger. Starting in 1967 at least, each morning at dawn O’Heaney could be seen ritualistically laying 9’”x 6” roofing tiles on the ground in the central open courtyard of his housing estate. His focus was on the creation of arbitrary-seeming wide gridded patterns. O’Heaney usually began about 6AM, completing the work by 7AM. By 9AM he would have dissembled the work and put the tiles back into the duffle bag that he used to store them. Tuesdays and Wednesday of each week for some reason he would take a holiday, but notably his practice extended to Sunday morning, a subject which later became cause to comment. Apparently O’Heaney had been doing this for some time before it was noticed within the housing estate—as was later said, his neighbors merely thought he was getting ready for some kind of job. * Though he was affable and a polite man at all times, the neighbors who spoke to him were entirely puzzled by his replies. He spoke about unknowables like “convex thinking” and “the Hemiola” and “the Black Stripe Changer” and “psychogeography” and “jynx-backs”—all in long, contorted and sometimes agrammatical sentences. When assembled questioners couldn’t understand, O’Heaney was apologetic but couldn’t provide any explanations that didn’t amount to more of the same. Outside of these actions in the courtyard, he went about his daily life much as he had before, interacting as an unremarkable and mild-mannered young man, apparently unable or unwilling to discuss the roofing tile business when outside the courtyard. (Though twice medical examiners were summoned, they met O’Heaney outside the estate, and found him to be perfectly normal). After a few weeks of these regular performances by O’Heaney word eventually reached the press, who then did its best to keep the story alive in fits and starts over next two years, with only limited development. Headlines rang out in the local, county and national press of an evocative brief: “Roofing Is My Art”; “Here is The Roofer”; “I Make No Sense, Says Man”; “This Is What Modernity Gets You!” (Catholic Quarterly); “Our “Artist” Refuses to Comment!”; “Residents Suffer Over “Abstract” Carpenter”; “’Tiles’ is On About Something… or Perhaps Not!”; “Is this a protest?”; “Franz Kafka’s Grandson” (Literary Review); “O’Heaney The Obscure”; and “Only in Ireland” to name a few. Frequently the articles were near repeats or plagiarisms from one paper to the other and included much reshuffling of information, with a comment (real or invented) inserted here and there to add flavor, though even for casual readers the incessant, incomprehensible sameness of it was a problem. O’Heaney’s neighbors generally liked him, and the police were only called in a few times during his tenure, and did nothing, a fact owing most likely to his extremely likeable disposition. The papers strung it on as much as they could for two years without any real resolution, and eventually it petered out. Two years after the last article Heaney stopped—also without explanation. Perhaps little would have come of O’Heaney’s behavior if he had not been “discovered” for art criticism in 1989 by Genevieve Libieron, a minor Parisian arts journalist with French father and British mother—who wrote a narrowly published book that leaned heavily on O’Heaney’s legend titled “Origins of Irish Post-Lettrisme.” This seems to have been the first book to situate O’Heaney in the post-war avant-garde continuum and it got little notice at the time of its publication, though subsequently it has been the subject of increasing debate within the sort of the culture which has led, ultimately to this web site. Libieron’s “Origins” was highly ungrounded and speculative in its outlook, and to the extent it has received attention, it has created a very confusing set of complications to understanding Heaney. How Libieron discovered Heaney is puzzling, though from her other writings, she seems to have visited Ireland a number of times, most productively to attend the post-situationist “Ruins of Glamour” show in 1986. Perhaps at this show she may have made contacts that put her in contact with interview subjects, though attempts to confirm any of her interview contacts mentioned in the book have resolutely failed. Complicating things, Libieron left art criticism definitively in 2008, just as her book was beginning to have an impact on continental art criticism, by virtue of marrying Qatari billionaire Abdel Wassim El Whani, after which time she has been entirely unreachable and absent from public life. In the absence of the author to debate, skepticism and speculation about her work has spun out of control. L’ exagération de certains Heaney forme géométrique de base par son complice “insistance “ sur regurgetation de quelques formes simples représente simultanément la forme objectivée d’une langue et aussi les exceptions intérieurs à un mode de vie ; celui qui ne peut être simultanément collective et produit par un certain manque dans le totalement des signes. The book goes on to suggest vague connections between Heaney a variety of mid-brow artists in Ireland who had their experimental moments, as well as even less substantiated connections to obscure wings of the European S.I. and ties to NYC Fluxus,** making him into a rather cosmopolitan character and a sort of “Dublin Connection” for the post-war avant-garde. As many subsequent commentators have pointed out, one of the strange things about the book is that each connection between O’Heaney and other culture figures is a very vague one involving multiple degrees of separation, and somehow seems out of phase with the narrative of his story, which in any case is rather garbled by Libieron. Somehow, none of this seems to really have registered among the current booming Irish Fluxus revival, whose curators, critics and promoters are more than happy to have Heaney as a seminal figure, loveable grin and roof tile in hand, inscrutable as ever. Two further facts may complicate the final analysis forever. First, the present author, on a very outside hunch, made an extensive medical records search in Dublin and was able to find three records of a man named O’Heaney, fitting the description but using incorrect identification numbers, seeking what would be understood today as neurological consultation at St. Mary’s Hospital. No notes on the consultations were retained—but the reported symptoms seem to suggest either stroke or severe migraine. The paranoid winds blowing in the opposite direction, another fact sticks like sand blown right into the eye. 2014 saw the unofficial French publication of the complete letters of Michele Bernstein, the actual brains of the Situationist International, by Stropos Press. In a letter to her homosexual friend Pierre Mongu, Berstein complains of an Irish couch-surfing houseguest who is lionized by both Debord and Henri Lefebvre as being the embodiment of “the politics of the ineffable.” A charming man she refers to only as “M. O. H.” that demands nothing of her, she nonetheless can’t wait for him to leave the apartment after a long (two week) visit, and makes reference twice in the letter to his carrying a large suitcase containing “some kind of slate rectangles which were to do with his art” about which he was decidedly evasive. Bernstein seemed to have disliked him on purely xenophobic grounds. Perhaps this last bit is entirely unrelated, to be sure, but it is enough to give a scholar of the O’Heaney affair a graveyard shiver, given the absolute lack of other documentation or available reference to place the tidbit in context. * perhaps as good a definition of art as any. ** Libieron describes O’Heaney showing her a collection of “sound schemas” by himself and other Irish artists and how he gave her some of these scores as a gift on one of her trips to Dublin; she notes that O’Heaney was corresponding with George Brecht in New York about these works, and had plans to publish an anthology of the schemas. Examples are shown here – these are interesting in that they suggest a burgeoning Fluxus-influenced experimental composition scene in Ireland. 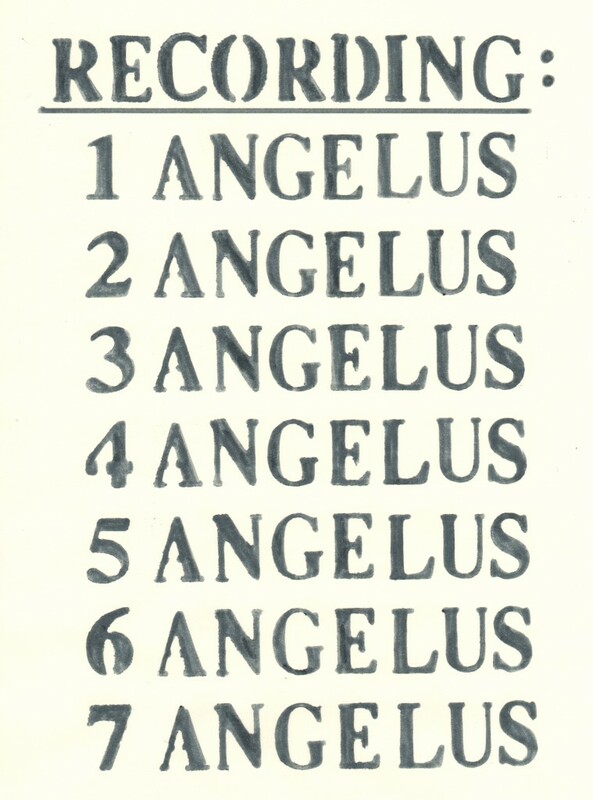 The focus on the Angelus bells in one of the scores suggests it might be connected to conceptual artist Donal Heraghty; the composers of the others are completely unknown. This entry was posted in Improvisation, Politics, Sculpture. Bookmark the permalink.